Leighton Baines talks to pupils at Linacre County Primary School. 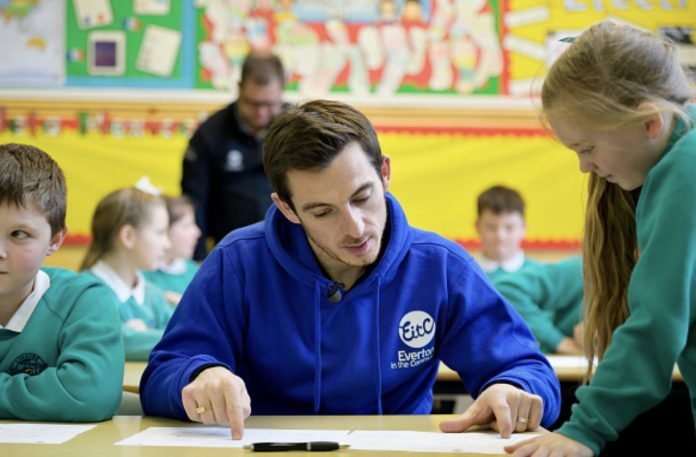 Leighton Baines returned to the classroom earlier this week in a bid to help students at a Bootle school tackle mental health issues. 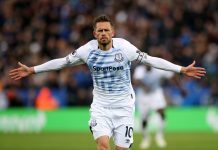 The Everton left-back made an appearance at Linacre Country Primary school as part the ‘Tackling the Blues initiative, a joint campaign run by Everton in the Community (EITC) and Edge Hill University to support young children at risk of mental health problems. One of the highlights of the day was Baines’ involvement in a game of ‘emoji bingo’ with the group of six-to-ten-year-olds. The exercise, which asks children to draw nine different emojis to show how they are feeling, is designed to make youngsters more comfortable about expressing their emotions from an early age. 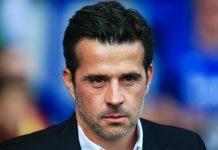 And the 32-year-old Blues stalwart suggested that such activities were vital as EITC and others attempt to change the mental health landscape for young people. He said: “Today has been a really fun and enjoyable session but with a really important underlying message for the children. 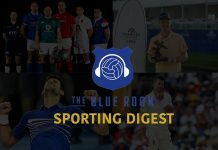 “It’s key that Everton in the Community and Edge Hill deliver it that way so it stays fun for the kids but still enforces the message that it is ok to feel different feelings at different times and it’s also ok to talk about it. Since its launch in 2015, the initiative has helped over 300 young people, providing important support to those without access to mental health services. Speaking at the end of the day’s activities, Tackling the Blues’ Project Lead Jon Jones added that Baines’ presence had helped get the message through to the students: “It was fantastic to have Leighton come along to one of our sessions and spend so much time chatting to the pupils and get involved in a game of emoji bingo with them!